Discover Mini Dental Implants with Dr. Akeel in Charlottesville, VA! There are a variety of dental implant procedures available, including mini dental implants, which are typically used to stabilize a full-arch denture. Dr. Ed Akeel provides mini dental implant treatment for patients looking to regain a full smile in a manner that is efficient, affordable, and minimally invasive. At Dentistry By Design, we want to help our patients achieve the best smile possible, and with mini dental implants, patients can retain their dentures, their smile, and their overall dental health. Denture-stabilization implants, better known as mini dental implants, are small titanium posts that are placed into the jawbone for the stabilization of a full denture. Patients who are unhappy with the retention of their dentures may benefit from the increased security that mini dental implants offer. A metal housing that is incorporated into the base of the denture. A rubber O-ring, located in the metal housing, to provide the seal that locks the pieces into place. 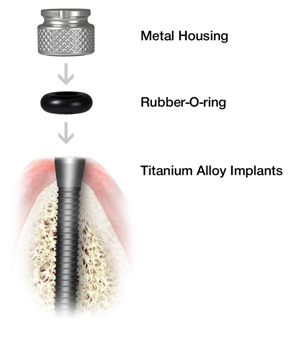 Mini titanium alloy dental implants, which are rooted into the jawbone and act as an anchor to stabilize a lower denture. Many denture wearers experience a loss in jawbone density over time, and mini dental implants accommodate jawbone issues by being smaller in diameter and needing less room in the jawbone to be placed. The placement of mini dental implants is thus minimally invasive and will not require a lengthy healing period. In our Charlottesville dental office, we place mini dental implants using local anesthesia. Typically, the procedure is completed within one appointment in just two hours! First, Dr. Akeel uses a precise and controlled technique to insert the small diameter implants, which are around two millimeters wide, into the jawbone. The tops of the mini dental implants (which resemble a small ball) protrude from the gum tissue and provide a secure anchor for dentures. Metal housings, which carry a rubber O-ring, will be inserted into the bottom of the dentures. The dentures will then be placed on top of the mini dental implants, allowing the O-ring to snap over the ball like a socket and lock the denture firmly into place. The result is a seamless, polished smile that fits securely in place. The implants are removable, but are designed to help your dentures function like natural teeth, making it easier and more comfortable to eat, talk, and laugh without messy denture adhesives or creams. Please contact our Charlottesville dental office with any questions or to schedule your appointment for Mini Dental Implants.